SCUBA stands for Self-Contained Underwater Breathing Apparatus. Is it difficult to learn SCUBA? Learning to dive is a lot easier than you'd think - lots of people try it with just some basic knowledge and help from the instructor. All that is required is good overall health and the desire to explore the underwater world. Every year, thousands of people, from young teens to senior citizens, become certified Worldwide. What will I be doing in the classroom? You'll learn about the basic physiological concepts concerned with diving - the effects of pressure and water depth on your body and the equipment you'll be using. As you dive deeper, the pressure on your body increases. You'll learn everything from how this pressure changes the flow of air your regulator delivers and the amount of nitrogen absorbed into your blood, to the effect water has on sound and light. You'll also learn all about the equipment necessary for safe SCUBA, and how to properly fit and take care of it. What will I be doing in the pool? The pool (here we are able dive in a shallow, protected ocean area) is also where you begin mastering basic skills: breathing from a regulator, safe descent and ascent procedures, proper buoyancy and emergency protocols. This is where the fun begins: putting on the equipment and blowing bubbles at the fish! Few things in life compare to the sensation of being able to breathe underwater as you move through a weightless dimension that allows you to move in any direction you like with a mere flick of your fins. Your checkout dives allow your instructor to determine if you have mastered the skills you need to be a certified diver. You'll be doing the same things you practiced in the shallow water during the first sessions of your class - the only difference is, you'll be cruising in the open ocean. Can I try SCUBA without getting certified? Yes, you can! You have two options with our Discover SCUBA program. You can opt for a one-tank experience (one dive) off the shore or a two-tank (two dives) off the boat experience. Both include a short classroom session during which you are introduced to the equipment and basic rules of diving. You'll practice several essential skills in the water. Then you are taken on a guided shallow dive, closely supervised by your instructor. These courses are a safe way to try SCUBA and decide if you want to become certified. If my ears hurt when I dive down below the surface, will that prevent me from diving? The "squeeze" you feel is caused by the pressure of the water pushing against your eardrums. One of the first things you'll learn in scuba class is a simple technique of equalizing ­ very similar to what you might do on an airplane. When done properly, you will equalize the pressure on each side of your eardrums and you won't feel any pain in your ears. What if I run out air? You will have an air gauge that tells you exactly how much air you have left. During your training dives you'll always be at a shallow depth, and later when you move to deeper water you'll become used to checking your air gauge as much as you would check your gas gauge while driving a car. Our certification course is structured so that your questions are answered and you feel comfortable with your life support equipment, its proper function and what to do in the unlikely event that something doesn't work as planned. Recreational scuba diving has a lower incidence of injury than football, baseball, volleyball, soccer, tennis, racquetball, swimming, water-skiing and bowling! Does it cost a fortune to get into SCUBA? The price of certification varies, depending on how you decide to do your class. For a certification that can give you a lifetime passport to the underwater world, it's really quite affordable. Owning all your equipment is more convenient, makes you a better diver because you're more comfortable and cost effective if you are going to dive more than a few times a year, and most dive centers rent it if you are not. Do I have to buy all that equipment to get started? No. The only thing we strongly recommend you buy when you are getting certified is your mask, snorkel and fins - these items must be fitted to you personally with the help of a dive professional. We provide the BC, regulator, wetsuit, weights and tanks during training. The purchase of diving's life support equipment is best left until you've completed your certification and have a better idea of what diving is all about and what your individual needs might be. Your instructor will be able to help you decide. Can you certify me while on vacation? YES! If you complete your classroom and pool sessions in your hometown, you have only to complete four training dives while on vacation over two days. set along the coast of Northumberland Strait between Shediac and Miramichi. Just nestled in off the Richibucto River. The bottom composition is a mix of sand, silt and mud in the river while the Strait diving boasts rock ledges and amazing visibility. The diving here is suitable for beginners, intermediate and advanced divers alike. 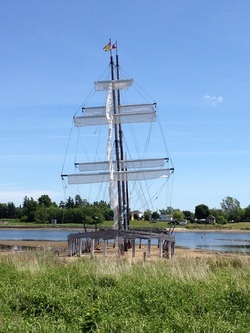 Rexton is teeming with maritime heritage and a rich shipbuilding history that dates back to the early 1800's.